After a season of uncertainty, Norfolk Admirals assistant coach Darren Rumble may be the lead candidate to take over head coaching duties from Steve Stirling, who was reassigned as a scout. Now that things seem to be calming down up top in Tampa Bay, the Norfolk Admirals could use a little settling of the waters as well. 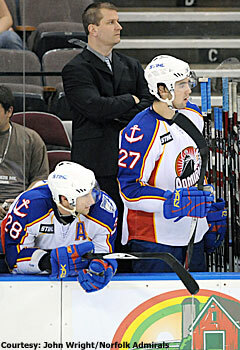 The Admirals’ offseason so far has been right out of bizzaro world when it comes to their coaching situation. Head coach Steve Stirling was out, but still somewhat on the inside. Assistant Darren Rumble was pushed toward the exit. These days, Stirling could hardly be more removed from the scene while Rumble could be coming back as the boss. At the end of the season, Stirling was reassigned to a scouting position within the organization. He had a year left on his contract and was OK with the move at first. But with the pending ownership change of the Lightning, he wasn’t sure where he’d find himself after the 2008-09 season. So he agreed to a two-year deal to coach in Germany, which he hopes will eventually lead to his return as an NHL scout. Rumble, meanwhile, was initially told his contract would not be renewed once it expired on June 30. But according to the Newport News' dailypress.com website, Tampa Bay’s new ownership group had Rumble fly to Los Angeles earlier this month to interview for the Admirals job. He could be the leading candidate for that post. For what it’s worth, Stirling endorsed his former assistant. Good luck, old friend – The Chicago Wolves’ workplace will never again seem the same to general manager Kevin Cheveldayoff. When Chicago coach John Anderson was hired for the same job in Atlanta last week, it broke up one of the longest-running teams in the minors. Anderson and Cheveldayoff joined the organization at the same time, in the summer of 1997. Together, the duo helped deliver two Turner Cups and two Calder Cups. While the Thrashers and Wolves will work together to find Anderson’s replacement, Chicago will have the final say. One possibility is current Wolves assistant Todd Nelson. Meanwhile, in Grand Rapids, the ending of a one-season experiment means that the Griffins are looking for a new coach. Grand Rapids let go of Mike Stothers after just one season in charge. Parent club Detroit hired Stothers, as was its right in the first year of the new affiliation agreement with the Griffins in 2007-08. The pact also let the Griffins make a change and revert back to bringing in their own boss after the season, a move the team jumped at when it failed to make the playoffs under Stothers. McNamara said he and Detroit will narrow a list of candidates down to three by mid-July before a choice is made. He said Jim Paek will return as an assistant coach of the team. Homeward bound – Hockey and his hometown of St. John’s, Newfoundland., have always been two things close to the heart of Glenn Stanford. They were easy to link until a couple of years ago, when the St. John’s Maple Leafs closed up shop and jumped to Toronto. This preseason, Stanford has arranged a quick reunion of sorts. Stanford, now president of Hamilton, was the driving force in arranging a three-team exhibition game tournament among the Bulldogs, Manitoba and the Toronto Marlies from Oct. 2-5 at Mile One Centre. Stanford initially had discussions with the other two teams about getting together somewhere in northern Ontario. When St. John’s officials inquired about holding the party at their place, Stanford jumped back to familiar ice. Stanford helped run the St. John’s Maple Leafs during their AHL years of 1991-2005. But Stanford stressed that the tournament is not necessarily a portal for the league’s long-term return to the site. Panthers, Rochester team up – The one AHL franchise that needed a dose of stability more than any other finally got a couple of them last week. Once-proud Rochester began its climb out of the ruins with news that it had agreed to a new three-year lease to keep playing in the War Memorial at Blue Cross Arena. It also nailed down a three-year affiliation with Florida. The Panthers had been co-affiliate with Buffalo the past three seasons. The Sabres have moved on to partner up with Portland. The man behind the financially troubled Amerks’ rescue attempt is new owner Curt Styres, a partner in the Canadian cigarette conglomerate Grand River Enterprises. Last month, the AHL approved his purchase of 60 percent of the Amerks. Earlier this month, the National Lacrosse League OK’d his purchase of the Rochester Knighthawks.